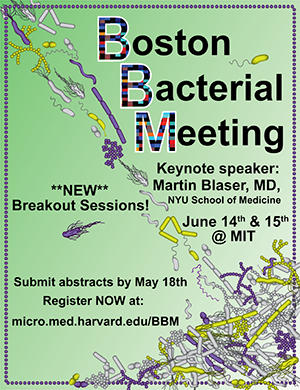 Registration is open for the 2016 Boston Bacterial Meeting! For over 20 years, the annual Boston Bacterial Meeting (BBM) has brought together microbiologists from both academic and industrial settings from New England and beyond. Last year’s BBM was attended by almost 500 researchers, representing over 100 labs and companies. BBM2016 will take place on Tuesday, June 14th, and Wednesday, June 15th at the Massachusetts Institute of Technology in Cambridge, MA. We are pleased to host Martin Blaser, M.D.from the NYU School of Medicine as this year’s keynote speaker. Dr. Blaser and his lab have conducted groundbreaking work studying the microbiome and the contribution of community structure and dynamics to disease processes in the host. Dr. Blaser is also the director of the Human Microbiome Program at NYU School of Medicine and author of Missing Microbes: How the Overuse of Antibiotics is Fueling Our Modern Plagues. We hope that you can join us for this exciting cross-section of current microbiology research! REGISTRATION: Please click here to register, and learn more about the meeting.